In the broader context of Amazon’s ambitions to build an operating system for the home, to expand into pharmacies and health care, to become a hit-making television production studio—this is the logical next step in turning Prime into the ultimate “life bundle,” a single membership program to bind consumers to every possible commercial need. It can own the search platform and the product, so that when a dad says to the smart speaker on his counter, “Alexa, I need brown rice and pork,” the product that arrives is an Amazon-branded box containing Amazon–Whole Foods–branded rice and pork. Amazon announced that certain members of its Prime subscription program can order Whole Foods items to be delivered within two hours. The program debuts this week in several neighborhoods in Austin, Dallas, Virginia Beach, and Cincinnati. Delivery is free for orders over $35—not exactly a challenge at a store nicknamed “Whole Paycheck”—with a $4.99 charge for cheaper purchases. Desperate dinner-party hosts can expedite one-hour delivery of fresh produce for $7.99, in many cases less than the cost of an Uber to the grocery store and back. 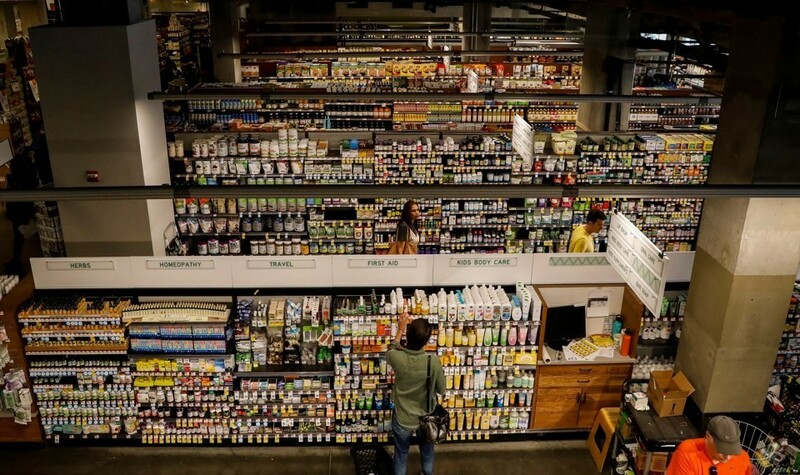 When Amazon spent $14 billion on Whole Foods last year in its largest-ever acquisition, many analysts saw three obvious advantages for the retail giant. First, its CEO, Jeff Bezos, would Amazon-ify Whole Foods, cutting the prices of popular items to increase foot traffic and overall revenue. Second, Amazon would use Whole Foods’ 400-plus upper-middle-class locations as distribution nodes for a range of products. Third, the company would try to turn Whole Foods into an online-retail company, by allowing households to order food on smartphones (or via a smart speaker like the Amazon Echo) and have fresh produce dropped off at their doorstep, just like they would a book or a toothbrush. The analysts were right. Amazon is doing all of the above—cutting prices and leveraging Whole Foods’ locations to build an on-demand food-delivery service. And that on-demand food-and-meal delivery service may be set to take off. A study commissioned by the market-research firm Euromonitor projected that the market for such services will grow 15 times faster than the restaurant business through the end of this decade. And this might just be the beginning. Greg Greeley, Amazon’s head of Prime, is transitioning to a new position overseeing Whole Foods’ integration into the company, CNBC has reported. It would be a mistake to treat every Amazon announcement as an Amazon accomplishment. On-demand Whole Foods delivery could turn out to be a giant mess. Indeed, Amazon has struggled with grocery-delivery services before, shutting down its Amazon Fresh program in several cities last year. Six months from now, the dominant news story about “Whole Foods Prime” could be a wave of anecdotes about overwhelmed Whole Foods workers in Virginia Beach or Cincinnati, or tales of zucchini that arrived so lukewarm and smushed as to resemble ratatouille. Execution matters, and excellent execution isn’t an inevitability, even for a logistics master like Amazon. But it would be a bigger mistake to analyze Thursday’s news in a vacuum, because this announcement is bigger than heirloom tomatoes and two-hour delivery windows. In the broader context of Amazon’s ambitions—to build an operating system for the home, to expand into pharmacies and health care, to become a hit-making television production studio—this is the logical next step in turning Prime into the ultimate “life bundle,” a single membership program to bind consumers to every possible commercial need. As Amazon extends into more product areas, it can own both the search platform and the product, so that when a dad says to the smart speaker on his counter, “Alexa, I need brown rice and pork,” the product that arrives is an Amazon-branded box containing Amazon–Whole Foods–branded rice and pork. This sort of vertical integration is invaluable for Amazon. For one thing, the creation of an on-demand Whole Foods product makes the company’s Prime subscription more valuable. Enriching Prime is arguably Amazon’s most important goal, given the lifetime value of a Prime subscriber. What’s more, as Amazon becomes the top-of-mind destination for not only books but also toiletries, medicine, and chicken breasts, it becomes the first-stop destination for all of its customers’ searches. And what comes with search volume? Advertising. Indeed, Amazon’s ad business—which includes sponsored ads on Alexa, suggested items on Amazon search pages, and even ad boxes around the internet on other sites—grew 60 percent last quarter, faster than Google’s or Facebook’s, albeit from a lower base. The business is on track to make as much as $10 billion in revenue by the end of this year, or about one-quarter of Facebook’s total revenue in 2017. As Amazon draws more consumers into its orbit, it will also pull competitors into a deflationary cycle: Each time the company enters a new industry, like those for grocery stores or pharmacies, the stock valuations of the sector’s largest companies decline, as investors anticipate that Amazon will pull down the industry’s profits to zero in order to draw in consumers and maximize cash flow. Amazon was a fascinating buyer for Whole Foods for just this reason. 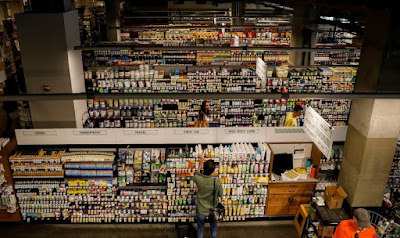 It is the anti–Whole Foods, forever evincing a no-frills obsession with low prices and absolute convenience over artisanal touches. And yet, the two companies are perfect partners. Whole Foods became a kind of cult for its most devoted customers, who sacrificed their weekly food budget on the altar of artisanal produce. Jeff Bezos’s ultimate ambition is similarly cultish: to build a pan-commercial enterprise, where every consumer question is best answered by first asking Amazon. The company is a leveraged bet on absolute customer convenience. And nothing says “absolute customer convenience” like yelling the word kale! at a box in one’s living room and finding fresh greens on one’s doorstep within120 minutes.